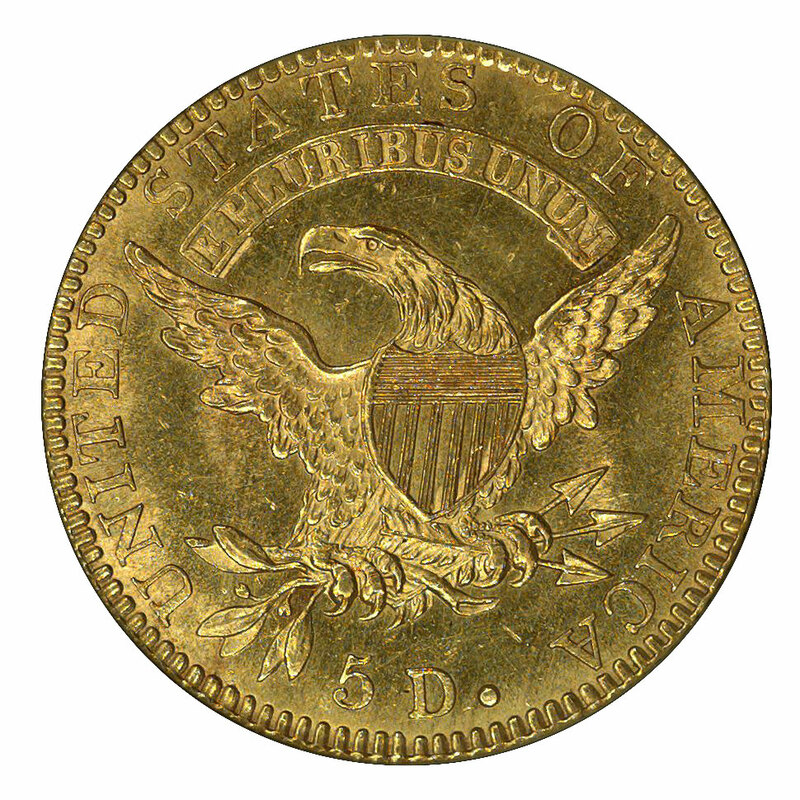 Among early United States gold coins (those made before the weight reduction of 1834), the half eagles are the most affordable to collectors. Of course, not all collectors will consider a five-figure price affordable, but a serious hobbyist who is determined to own at least one gold piece from this period will likely focus on the half eagle. 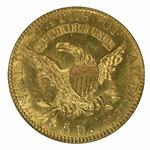 The five-dollar piece was the most useful of the gold denominations during these early years. 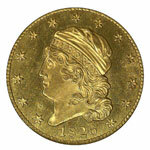 In fact, from 1809 through 1820 it was the only gold coin minted by the USA. This utility is reflected in the relatively large numbers coined as compared to the eagle and quarter eagle. The fact that all United States gold coins were worth more than face value during most of the pre-1834 period weighed heavily against their survival, but half eagles seem to have survived in greater numbers as a direct correlation to their higher mintages. The Capped Head type of 1813-34 actually represents two subtypes. The coins of 1813-29 were struck in open collars and have a larger diameter and more shallow rims than the modified pieces of 1829-34, which were coined in close collars and have sharply raised rims. Both versions were based on John Reich's original design of 1807. 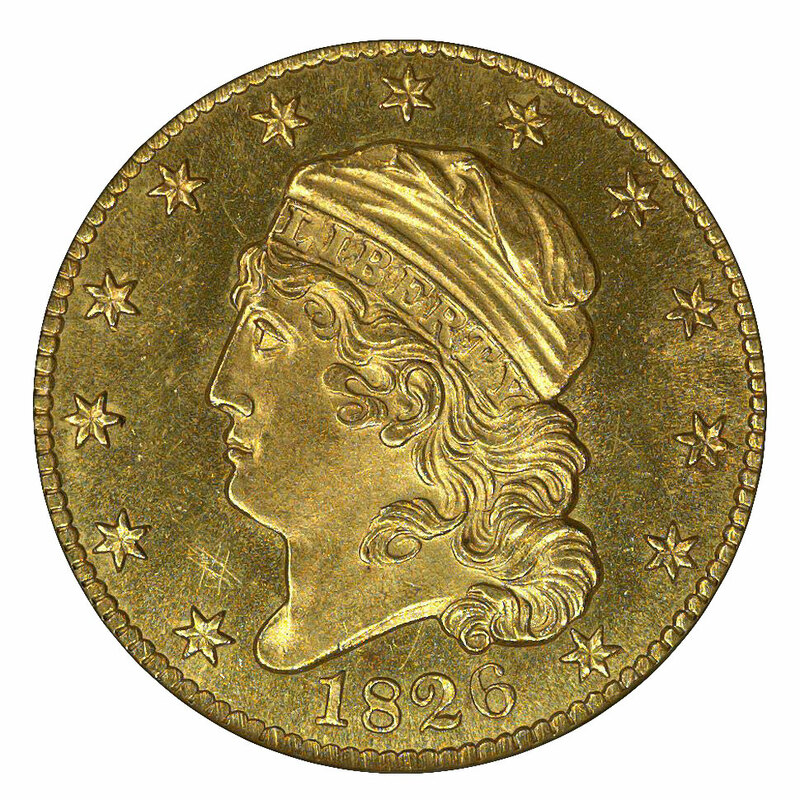 Numismatic scholars are uncertain whether the 1813 head was the work of Reich or his superior, Mint Engraver Robert Scot. More certain is that Scot's successor, William Kneass, performed the work of modifying this type in 1829 to suit the new technology of the close collar. Because they contained more than five dollars worth of gold as measured against silver, coins of this type saw only limited circulation. Consequently, they are rarely seen in grades below Very Fine. Coins having extensive wear were probably used as jewelry items or carried as pocket pieces, suggesting that collectors should examine them carefully for signs of solder removal, piercing and repairs. Also quite scarce are truly uncirculated examples, both the softness of gold and the shallow rims of the 1813-29 pieces contributing to rapid abrasion. The modified coins of 1829-34 were less prone to wear, and a greater percentage of their total population survives uncirculated. Capped Head, Large Size half eagles are known for every date from 1813 through 1829, with the exceptions of 1816 and 1817. Of course, the U. S. Mint is known to have used dies without regard to the date they bore, so recorded mintage figures are not wholly reliable. The only date that is encountered in mint state condition with any frequency is 1813. Both its large mintage and the novelty of its design may have contributed to a higher survival rate for this date. The modified subtype of 1829-34 is known for every date in that span, but none of these coins stand out as being more common than the others. Despite substantial annual mintages (1834 being the sole exception), the attrition rate of these coins was very high. They are all rare in any grade, though a greater percentage of the surviving population is found in or near uncirculated condition. This subtype is much more rare in overall numbers than the large diameter issue of 1813-29 and presents a real stumbling block to the type collector. Both subtypes were subject to weakness of strike at their centers. The typical coin will be indistinct in the hair above Liberty's forehead, at the upper part of the shield and in the feathers to the left of it. As made, most of these coins had luster ranging from prooflike to lightly frosted, but years of abuse by both the general public and misguided numismatists has left many examples impaired through harsh cleaning. The major grading services understand this fact and are more lenient in certifying these vintage coins than they are with more recent issues.